Increasingly, I meet with couples who want to involve all guests in their wedding ceremony in some way. This makes an inclusive and engaging ceremony for all. 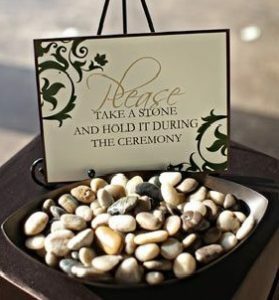 As guests enter the wedding ceremony location, a small stone or rock (which can be decorated or polished in advance) is handed to each of them or with a small sign as shown above. Then at a point during the ceremony (often after the couple’s wedding vows), guests will be asked to make a wish or blessing to the bride and groom. Blessings and good wishes can be made in silent or aloud at a point during the ceremony. 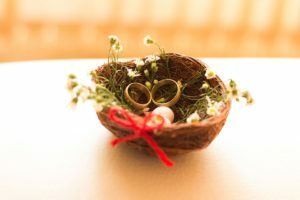 A ring warming is similar to the rock ceremony except that the couple’s wedding rings are passed around to each guest at a certain point in the ceremony. The rings should be tied or affixed to a ring pillow or placed in a decorative container (see above) to avoid any unnecessary accidents with the rings. Each person will hold the ring and again, provide a silent blessing or wish. For smaller weddings, the wish can be spoken aloud and of course, the ceremony would pause for this to take place. As they say, it takes a village to raise a child. In that fashion, a marriage is actually nurtured by family and friends throughout the years. Guests would be asked to stand and confirm their support and love for the couple by asking one or two of relevant questions. All guests can say a resounding “we will” to each question at that time – the louder, the better! This will work well particularly at smaller weddings – or large ones if timing is not an issue. Guests can also all be photographed as they enter the ceremony space, demonstrating that all guests are of great importance to the couple. This will work at any point during your wedding day (please see header photo). 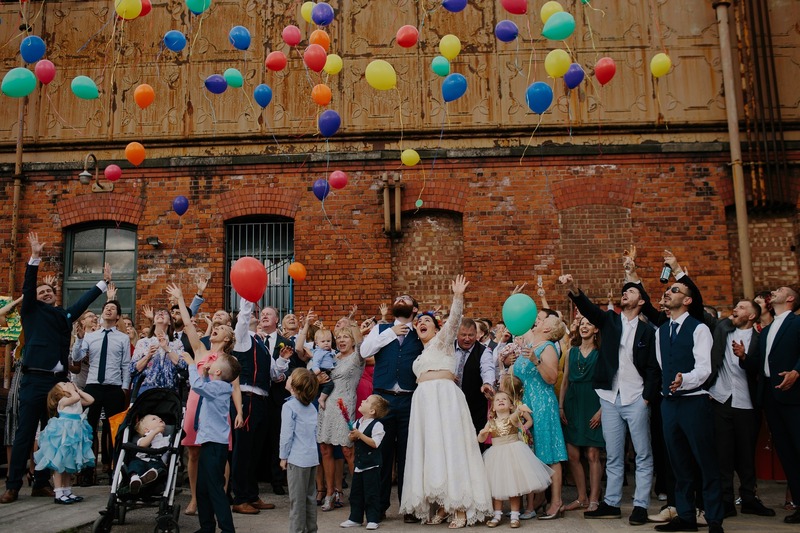 All that is needed are lots of helium filled balloons in different colours or wedding party colours providing another great photo opportunity to last a lifetime. If balloons are not your thing, how about bubbles, reducing the cost and equipment required? Another way to make your guests feel like they are a real part of your wedding is to ask them to wear a particular colour or piece of clothing. Items include but not limited to: a baseball/sports team shirt or hat, cowboy boots, blue jeans or simply by wearing a particular colour – which does not have to include the whole outfit but perhaps include the colour in a men’s tie or piece of jewellery. Your photographs will be fabulous.